Try newer OXCE, or put guns in all craft slots. Can you post a save just before it happens? HKs hunt down my Valkyries just fine, with the only crash being the Valkyrie to the ground. The game crashes when I access the inventory of some but not all soldiers. It will not work with OXC (OpenXcom). Note how the git commit id (.....7c8) in the window title bar doesn't match the one in the archive name (0c6c261bd). You are definitely running something else. 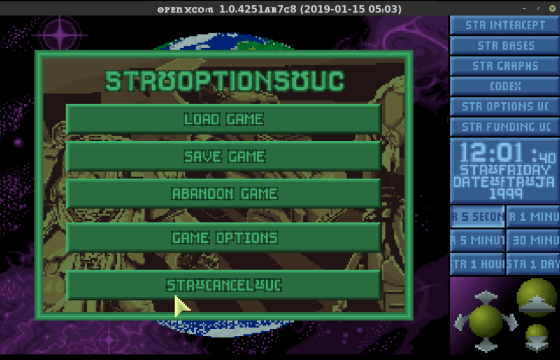 Also check out the main menu, the log, the start-up screen - they all show the version there. Hello Gentlemen, I found a bug on a Space Hulk map (017 version). 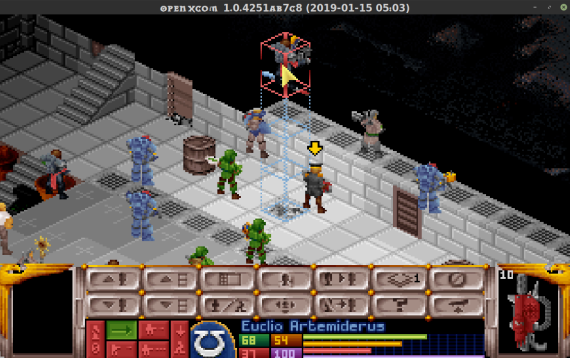 Sometimes enemy units - the culprit used to be the Carnifex in previous version, but in this case it is a Genestealer - is standing on an "elevator" square and don't move preventing the player destroying it and finishing the mission. I'll take a look at the save, but usually you can destroy the terrain or move away from the elevator and wait for the AI to move. For those of you who just downloaded version 018, the Techmarine's repair ability might not use the new script designed to fix the most damaged armor - we're uploaded a fixed version of the full mod, but you can just replace the attached ruleset as well. No need to look at the savegame, it happened just as you said. I destroyed the control and the last unit moved out. Found a big bug with version 018 - any alien bases generated under the new version will default to the wrong deployment STR_TERROR_MISSION instead of STR_ALIEN_BASE_ASSAULT. If you have a campaign going on version 018, open up the saved game in a text editor, find the section named "alienBases:", and replace any entries under that section that have "deployment: STR_TERROR_MISSION" with "deployment: STR_ALIEN_BASE_ASSAULT". If you are having trouble with the save editing, PM me with your save and I'll fix it. I'm also attaching a fixed alienMissions ruleset - replace the corresponding file in 40k/Rulesets with this one to fix the bug. I found a bug. I have attached the log, the savegame and a screenshot. Thanks, we're aware of this bug. It'll be fixed in the next version. To fix it on your end, go into missionScripts_40k.rul, scroll down to the bottom for the script named "Inquisition," and remove the line that says "label: 1".